RIO–Complete Recorded Musical. Book Coming Soon! There is an invisible barrier that divides the world of money from the world of poverty. Rio De Janeiro, once a world-class city now has over two million people in the slums, known as “favelas”, with nearly 60,000 children living on the streets. For generations, the family unit has broken down, with over one half of new births from un-wed mothers. One of the many hillside favelas of Rio is Dona Marta Hill, housing 12,000 residents of mostly mixed race, barely able to read, grateful to find work for $1 an hour. Permission to enter Dona Marta must come from Tamanero, the local drug baron who operates a $50,000 a month business from a hill-top hideaway equipped with Uzi’s, AR-15 assault rifles and grenades. Tamanero hasn’t been seen on Rio’s streets since 1991, the year he killed his way to the top of the gang. A network of oleiros – lookouts – passes his decision in whispers down the maze of alleyways in minutes. Politicians ignore the hill, except at election time. Police, too, rarely go to Dona Marta except for a cut of the drug profits. A brief walk through the village shows a labyrinth of alleys littered by chicken droppings and running sewage. Some of the rats are so large they chase the cats. Shanties are bunched so tightly that neighbors pass borrowed items from window to window. The Roman Catholic Church up the hill has bullet holes up and down its concrete walls, the result of gang executions. Tamanero rules the hill and sets the law. One teen-ager caught stealing a handbag had acid poured on his palm. A drunk who didn’t pay his beer tab had his nails pulled out. Young boys, called “airplanes” run cocaine to customers for roughly $500 a week, quite a sum in a country with a minimum wage of $110 a month. An enforcer can earn many times that, and Tamanero offers a nice “retirement” plan: He pays for the burials of traffickers killed by police and gives their families lifetime pensions. Yet, despite it all, Rio is one of the most beautiful places on earth, where often the most spectacular views are from the poor hillsides. 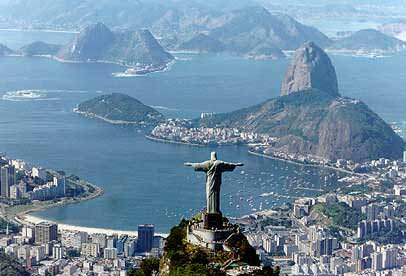 The Corcovado hosts Cristo Redentor, or Christ the redeemer statue, 100 feet tall and 2,100 feet above sea level. 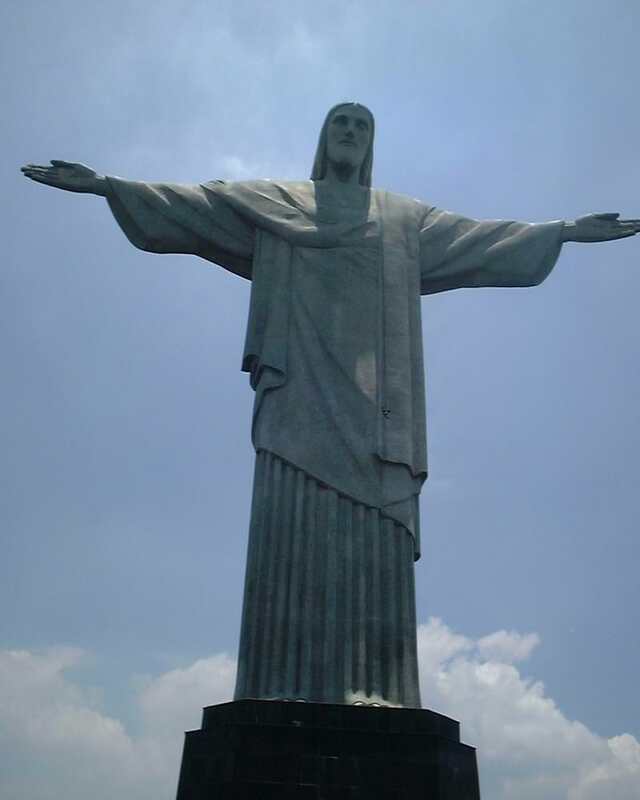 Christ’s outstretched arms measure 90 feet wide. Beaches? Trees? Mountains? Beautiful People? In Brazil, one astounding city has it all. Most importantly, rich or poor, black, white, or inter-racial, residents enjoy life. People smile, people samba, and people love. RIO is a passion play symbolizing the plight of poorer classes. The situation in RIO is no different than many third world mega urban developments. The situation in RIO is ALSO much closer in reality to the possibilities, which can happen in major American cities, if its citizens continue to ignore the increasing inner-city problems. “A vida trata voce como voce ce trata”……..Life treats you as you treat yourself. RIO.